Yes, yes, I used that one!! And I use it every time I go to Starbucks and get an iced tea – “I would like a black, unsweetened, venti iced tea. Shaken, not stirred.” They laugh at me, but the truth is that they actually make their tea by shaking it in a martini shaker. And it has the best flavor. I really like my tea shaken with ice. One of these days I have to start making mine the same way. One of these days. Really, I will. So here are hints on using and takine care of the mint. Iced tea is the first on the list, which was why it goes with shaken, not stirred. To make iced tea, use a single tea bag or one teaspoon of loose tea in a metal or paper filter. If it’s morning, use a black tea that you like. If it’s afternoon, use chamomile or some other herbal tea. I know that doesn’t sound like much, but the mint is what is flavoring your beverage. Cut 2 or 3 big stalks of mint and stuff into a small teapot (1 cup) along with the tea. Pour boiling water over all of it, steep (4 minutes for black tea; 6 for herbal. When done, pour over a big glass of ice, add lemon or sweetener if you like and enjoy! Have too much mint? Cut a bunch, wrap a string around the end, then hang upside down someplace without direct sunlight. When dry (several days), crumble into a freezer bag and freeze until needed. It’s hung upside down to keep the oils and flavor in the leaves. I freeze it to keep the flavor strong until I use it. Want to give some mint away? Pull off the bottom leaves to get a few inches of stem, then put into water. Use within a few days. Or keep changing the water until the roots grow hairs, then transplant into dirt. I’ve also transplanted mint straight into dirt and had it do fine. Mint is so hardy. I keep it trimmed back so it doesn’t go to flower. If it gets too clumped together, I dig up parts of it and plant into another pot. Or dig up parts of it to give away. It just doesn’t die. I don’t do anything special with it in the fall. It dies back around January (after it’s below zero for a while). It will start coming back as early as March. At that time, I take the biggest, hardiest clump and transplant it into fresh dirt to start growing all over again. This is a close-up of the spearmint. 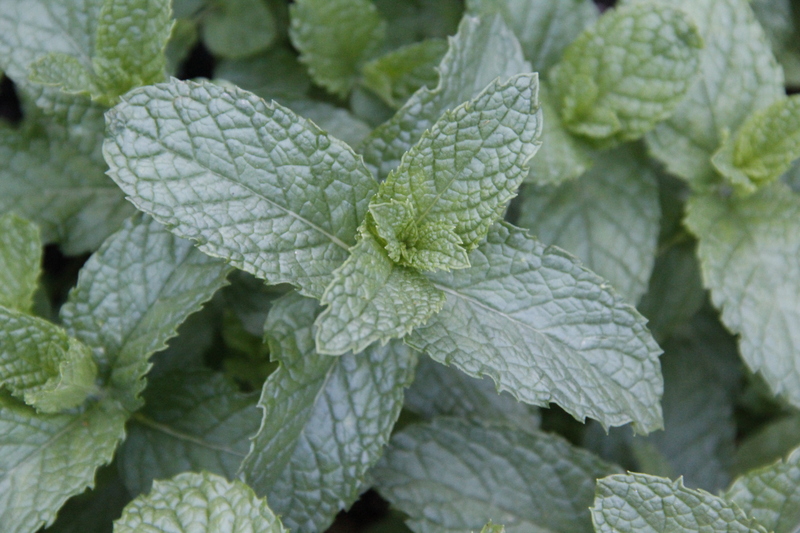 Peppermint leaves are smaller, pointy at the ends, and thicker, almost waxy. Word for tomorrow – SECRETLY. If you prefer to work ahead, see the list for the week under “A Word A Day”. It really does make a difference when it’s shaken. And I love mint. I wanted to respond to your answers but alas, your e-mail wasn’t enabled. Darn! I love peanut butter too. Natural is the best. Can’t keep it in the house, I love it so much. Yeah, I guess I have issues . . .
I’m not sure about why you couldn’t E-mail me. I’m not quite sure what to change either. Thanks though for coming by to leave a comment.